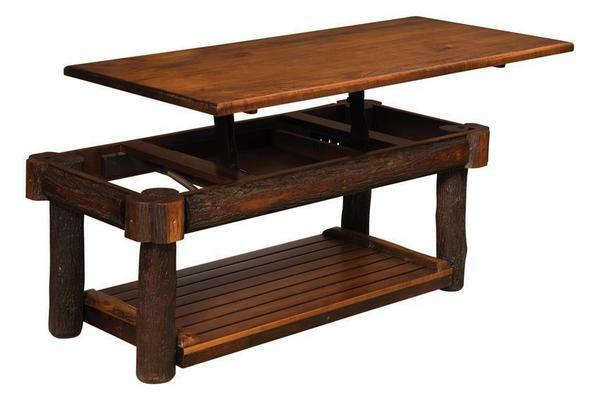 Our Rustic Hickory Lift-Top Coffee Table takes convenience to the next level with a table top that lifts up to your height for convenient access to your coffee mug or dinner plate while relaxing on the sofa. When you just don't feel like eating at the dining table this lift top coffee table will raise to the perfect height to satisfy your dining needs. This coffee table is recommended for a sofa seat height of 20". If you need it to accommodate another seating height, contact one of our friendly furniture consultants for a custom designed lift-top coffee table to fit your personal needs. Recommended Sofa Seat Height: 20"